It seems that we hear the terms Natural and Organic quite a bit lately. I applaud the effort more manufacturers make to reach people with products that they can feel good about using. The product line 100% Pure not only meets natural and organic standards, but the Vegan standard as well. No synthetic chemicals, parabens, chemical preservatives, sulfates, alcohol, toxins or animal products. Visitors to the store notice the body wash is water-consistency. This is because 100% pure elects to forgo thickeners, emulsifiers or any other fillers. The products clean and perform beautifully when introduced to water in the bath or shower. Their Sugared Lime Peel juicy body scrub is wonderful and uplifting with natural fruit acids and antioxidant vitamin C & E.
Their body creams are just that - creams!.... thick and rich with an abundance of natural fragrance. The Tangerine is my favorite. 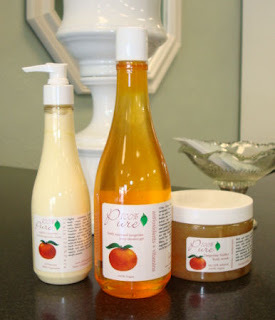 They use Avocado Butter and Grapeseed oils to emulsify their formulations. Sunflower: A warm floral with green notes, it is popular blended in all products, particularly eau de parfum or a Body Wash. This blend is only available until Fall. Blend with Figuier in a Home Ambiance Diffuser. Essential Oil blend of Lemongrass & Orange. Popular in our Sugar Scrub with Honey and Shea Butter, and with natural fragrance aficionados in Home Ambiance Diffuser blend. Essential Oil blend of Lavender France & Eucalyptus. Number one selling bath salt custom-blend. Wonderful to promote relaxation in our French Mineral Salt blend. Eucalyptus essential oil in Brazilian Sea Crystals: Use a few of these in your morning shower to help clear your head on these hot summer days... If you soak in the bath, a few Eucalyptus-infused crystals dissolve in the water leaving a spa-like Eucalyptus ambiance in their place. We are absolutely loving this Parada Pear and Sandalwood fragrance by Lafco New York. Manufactured in the European tradition by Claus Porto in Portugal, I have carried this line of products in all of my stores since 1996. Lafco owner Jon Bresler consistently creates well made, beautifully presented, wonderful smelling bath and home items. 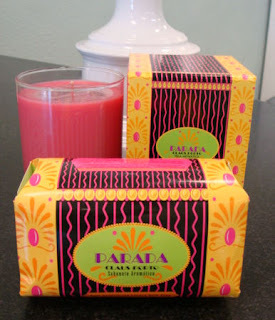 Parada is blend of warm sandalwood with a subtle hint of sweet pear. The fragrance blends effortlessly into your environment without being overpowering. Appropriate for any area of the home. The soy-blend candle burns evenly and has great fragrance distribution and the very large 12.34 ounce soap bar is 100% natural, vegetable based and contains Shea butter. The soaps are milled 7 times so there is no breaking or splitting as the bar becomes smaller. A fun gift for either a man or woman. For information on Lafco Claus Porto products you can call Melange at 818-703-8481 or visit http://www.lafcony.com/. Feuille de Frombaise & Green Tea in a Home Ambiance Diffuser: Green Tea is a perfect choice to enhance a crisp fragrance like frombaise (raspberry leaf) without losing the wonderful fruit notes that make it so popular to blend with. Santal & Ambre in a Home Ambiance Diffuser: A very sensual, warm blend perfect for a boudoir.